cmisanko@neo.rr.com with the subject as Prayer Line. Prayer Intentions may be written in our Book of Intentions located on a stand mounted to the wall in the Narthex. This Book is used to hold our General Intercessions for Mass. A basket for prayer requests for the Prayer Line is located in the Narthex on a wood table. 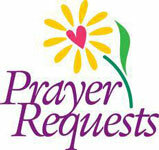 Please write your request on a prayer request slip, drop it in the basket, and it will be forwarded to a member of the Prayer Line for prayer support. Resources for staying reflective in important moments of ordinary daily life. The Examen Prayer for adults to review the day in the presence of God. Play or download this prayer on your phone, tablet or computer using Sound Cloud or Soundcloud App. Click on the download icon that is under Soundcloud. To volunteer to help with any of these Prayer activities, sign up below.